Make your first ski break with the kids a successful one – read our guide to a happy, stress-free family ski holiday. Teaching little groms to ski can be a tricky business – take it from someone whose own father could write a book on what not to do. Long story short: it was a disaster which begun with my sister and I rapidly descending down a mountain sans instructor (no snowploughing for us, thanks) and ended with a sprained ankle and a vow that I’d never ski again. A vow that quickly became undone when I started dating a snowboarder . . . but the moral of the story is: poor prep before a normal holiday equals stress, but poor prep (or in the case of my dad – no prep) before a skiing trip with kids equals stress magnified. To avoid this and to make sure that your kids aren’t left with the scars (I mean, literally, there were scars) of a bad first experience, read OnTheSnow’s guide to a successful family ski holiday on the slopes. A bit of research and preparation will go a long way to ensuring that your family ski holiday runs as smoothly as possible. We can’t prevent falls (all part and parcel of the fun and good for the ol’ character) but you can make sure that the gear they’ll inevitably take tumbles in is of a good quality, the resort you choose is child-friendly, and that the instructors can speak English. One of the most important considerations when you’re skiing are your clothes. No one likes being wet and cold and kids like it even less. To top things off, they don’t even have alcohol to make them feel better. So make their lives, and yours, a lot more comfortable and buy, hire or borrow proper ski clothes. If you want to save some pennies, head to discounted stores, like T.K. Maxx or Sports Direct, where you can often find decent pieces of kit (socks, base layers, gloves) for a fraction of the price. Or go one better and try eBay, Freecyle, or your friends. Look for proper base layers; merino wool will last for years. Take two with you and alternate them for the duration of your trip. Don’t forget waterproof gloves or mittens and a hat – skiing without them will be miserable. Helmets are key these days as well and a lot of people will be wearing them on the slopes. As for jackets, something bright that helps you to identify your grommit is a good idea. The brighter the better. You can save a fair amount of money by going to a smaller resort. 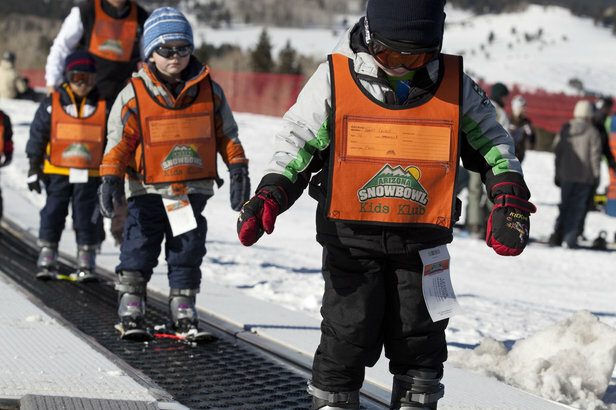 Children who are learning to ski don’t need acres of terrain to blast around in and the steeps won’t be much use to them either. Even if you’re an expert skier you might not spend a great deal of time on the slopes so it’s worth checking out which resorts have the most suitable runs for groms who are just starting out. 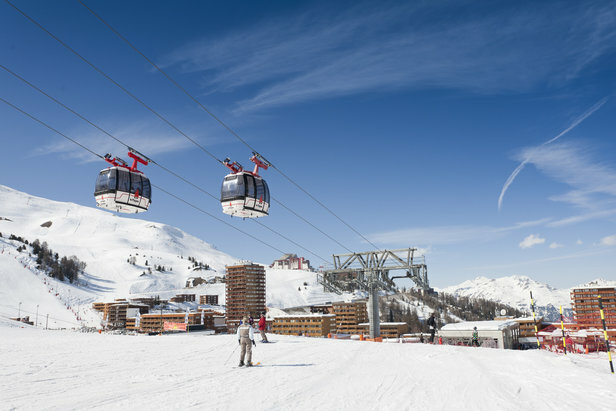 Some of the resorts that we rate include Les Carroz and La Rosiere in France (although the latter has quite a few drags) and Alpbach in Austria. Chamonix and Verbier are great once they can handle more challenging terrain but they’re wasted on kids who are still figuring out how to fix their bindings. Look for conveniently laid out resorts with nursery slopes near the centre of the village in order to avoid lugging heavy kit around. Ski-in ski-out accommodation is also great for tired little ones. Read "Best ski-i/ski-out hotels"
Drag lifts are supposed to tow you along the path until you reach the top of the run. The annoying thing about them is that you have to concentrate on not falling off. They instilled great terror in me as a kid – frankly, they gave me anxiety, more so than the skiing. Magic carpets on the other hand are wonderful – you just hop on a moving travellator-style belt and shuffle off at the top. Look for resorts with magic carpets or ski lifts that don’t require additional concentration. Ste Foy in France has moving carpet lifts and a fenced-off nursery slope right next to the village. These days, most resorts are set up with childcare facilities but they will vary in quality and in what they are able to offer. Not all resorts are set up to take care of really tiny tots so do double check what ages they are able to provide for. 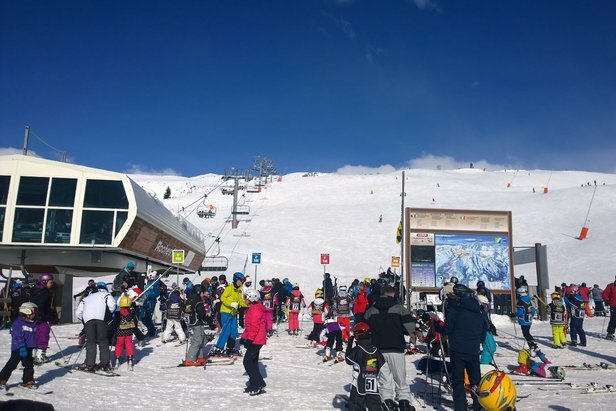 Other resorts, like La Plagne, France, can arrange for you to keep the same nanny all week. Check out "Five of the best ski holidays with childcare"
Book the ski-school before you depart for the mountain. This was probably the biggest error my dad made. He thought he’d be able to book lessons once we arrived at the resort but lo and behold there was no room at the inn. We managed to book an instructor, but not until day four of our holiday which was four days too late. On top of that, our instructor didn’t speak a word of English. Check the resorts’ websites for details of their ski schools – awards will be proudly displayed. You could go one better than pre-booking the school and book some lessons on a dry slope before you leave. You might be fortunate and have children that can’t wait to pound the mountain but some kids may feel apprehensive before they head for the slopes. A couple of hours on a dry slope will give them some familiarity with the gear and an extra boost of confidence when it comes to sliding around on the real stuff. From horse-sleigh rides and berry picking, ice-fishing, pirate villages on snow – the resorts have tried hard to create havens for groms. Mix up their skiing with one of these other unique activities and you’ll have a family ski holiday to treasure! 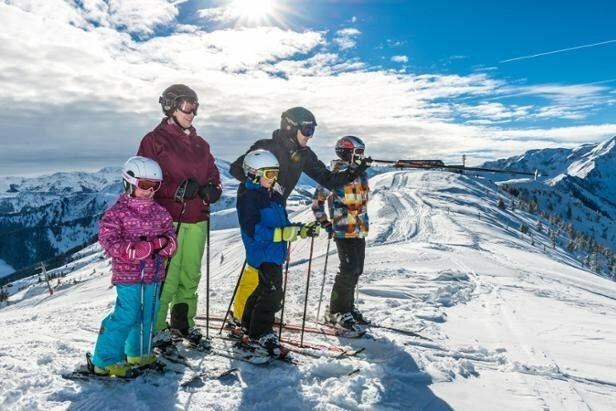 For more activities off the piste, see our article "Best resorts for non-skiing afternoons with the kids"
Follow our tips and you'll have a stress-free family ski holiday guarenteed.